The buzzword is "inclusion" and it refers to a trait that Western industrialized nations seem to be on the verge of losing: the ability to allow as many layers of society as possible to benefit from economic advancement and participate in political life. The term is now even being used at meetings of a more exclusive character, as was the case in London in May. Some 250 wealthy and extremely wealthy individuals, from Google Chairman Eric Schmidt to Unilever CEO Paul Polman, gathered in a venerable castle on the Thames River to lament the fact that in today's capitalism, there is too little left over for the lower income classes. Former US President Bill Clinton found fault with the "uneven distribution of opportunity," while IMF Managing Director Christine Lagarde was critical of the numerous financial scandals. The hostess of the meeting, investor and bank heir Lynn Forester de Rothschild, said she was concerned about social cohesion, noting that citizens had "lost confidence in their governments." It isn't necessary, of course, to attend the London conference on "inclusive capitalism" to realize that industrialized countries have a problem. When the Berlin Wall came down 25 years ago, the West's liberal economic and social order seemed on the verge of an unstoppable march of triumph. Communism had failed, politicians worldwide were singing the praises of deregulated markets and US political scientist Francis Fukuyama was invoking the "end of history." Today, no one talks anymore about the beneficial effects of unimpeded capital movement. Today's issue is "secular stagnation," as former US Treasury Secretary Larry Summers puts it. The American economy isn't growing even half as quickly as did in the 1990s. Japan has become the sick man of Asia. And Europe is sinking into a recession that has begun to slow down the German export machine and threaten prosperity. Capitalism in the 21st century is a capitalism of uncertainty, as became evident once again last week. All it took were a few disappointing US trade figures and suddenly markets plunged worldwide, from the American bond market to crude oil trading. It seemed only fitting that the turbulence also affected the bonds of the country that has long been seen as an indicator of jitters: Greece. The financial papers called it a "flash crash." Central banks are also running out of ammunition. They have pushed interest rates close to zero and have spent hundreds of billions to buy government bonds. Yet the vast amounts of money they are pumping into the financial sector isn't making its way into the economy. Be it in Japan, Europe or the United States, companies are hardly investing in new machinery or factories anymore. Instead, prices are exploding on the global stock, real estate and bond markets, a dangerous boom driven by cheap money, not by sustainable growth. Experts with the Bank for International Settlements have already identified "worrisome signs" of an impending crash in many areas. In addition to creating new risks, the West's crisis policy is also exacerbating conflicts in the industrialized nations themselves. While workers' wages are stagnating and traditional savings accounts are yielding almost nothing, the wealthier classes -- those that derive most of their income by allowing their money to work for them -- are profiting handsomely. According to the latest Global Wealth Report by the Boston Consulting Group, worldwide private wealth grew by about 15 percent last year, almost twice as fast as in the 12 months previous. The data expose a dangerous malfunction in capitalism's engine room. Banks, mutual funds and investment firms used to ensure that citizens' savings were transformed into technical advances, growth and new jobs. Today they organize the redistribution of social wealth from the bottom to the top. The middle class has also been negatively affected: For years, many average earners have seen their prosperity shrinking instead of growing. Harvard economist Larry Katz rails that US society has come to resemble a deformed and unstable apartment building: The penthouse at the top is getting bigger and bigger, the lower levels are overcrowded, the middle levels are full of empty apartments and the elevator has stopped working. In this sense, the crisis of capitalism has turned into a crisis of democracy. Many feel that their countries are no longer being governed by parliaments and legislatures, but by bank lobbyists, which apply the logic of suicide bombers to secure their privileges: Either they are rescued or they drag the entire sector to its death. It isn't surprising that this situation reinforces the arguments of leftist economists like distribution critic Thomas Piketty. But even market liberals have begun using terms like the "one-percent society" and "plutocracy." The chief commentator of the Financial Times, Martin Wolf, calls the unleashing of the capital markets a "pact with the devil." They aren't alone. Even the system's insiders are filled with doubt. There is the bank analyst in New York who has become exasperated with banks; the business owner in Switzerland who is calling for higher taxes; the conservative Washington politician who has lost faith in the conservatives; and the private banker in Frankfurt who is at odds with Europe's supreme monetary authority. They all convey a deep sense of unease, and some even show a touch of rebellion. If there is a rock star among global bank analysts, it's Mike Mayo. The wiry financial expert loves loud ties and tightly cut suits, he can do 35 pull-ups at a time, and he likes it when people call him the "CEO killer." The weapons Mayo takes into battle are neatly lined up in his small office on the 15th floor of a New York skyscraper: number-heavy studies about the US banking industry, some as thick as a shoebox and often so revealing that they have enraged industry giants like former Citigroup CEO Sandy Weill, or Stan O'Neal in his days as the head of Merrill Lynch. Words of praise from Mayo are met with cheers on the exchanges, but when he says sell, it can send prices tumbling. Mayo isn't interested in a particular sector but rather the core of the Western economic system. Karl Marx called banks "the most artificial and most developed product turned out by the capitalist mode of production." For Austrian economist Joseph Schumpeter, they were guarantors of progress, which he described as "creative destruction." But financial institutions haven't performed this function in a long time. Before the financial crisis, they were the drivers of the untenable expansion of debt that caused the crash. Now, focused as they are on repairing the damage done, they are inhibiting the recovery. The amount of credit ought to be "six times faster than it has been," says Mayo. "Banks now aren't the engines of growth anymore." Mayo's words reflect the experience of his 25 years in the industry, a career that sometimes sounds like a plot thought up by John Grisham: the young hero faces off against a mafia-like system. He was in his late 20s when he arrived on Wall Street, a place he saw as symbolic of both the economic and the moral superiority of capitalism. "I always had this impression," says Mayo, "that the head of a bank would be the most ethical person and upstanding citizen possible." But when Mayo, a lending expert, worked for well-known players like UBS and Prudential Securities, he quickly learned that the glittering facades of the American financial industry concealed an abyss of lies and corruption. Mayo met people who recommended buying shares in technology companies in which they themselves held stakes. He saw how top executives diverted funds into their own pockets during mergers. And he met a bank director who only merged his bank with a lender in Florida because he liked boating in the Keys. What bothered Mayo most of all was that his employers penalized him for doing his job: writing critical analyses of banks. He lost his job at Lehman Brothers because he had downgraded a financial institution with which the Lehman investment department wanted to do business. Credit Suisse fired him because he recommended selling most US bank stocks. Only when the real estate bubble burst did the industry remember the defiant banking analyst, who already saw the approaching disaster even as then-Deutsche Bank CEO Josef Ackermann issued a yield projection of 25 percent. Fortune called him "one of eight people who saw the crisis coming." The US Congress called on him to testify about the crisis. Today Mayo writes his analyses for the Asian brokerage group CLSA and they still read like reports from a crisis zone. Central banks have kept lenders alive with low interest rates, and governments have forced them to take up additional capital and comply with thousands of pages of new regulations. Nevertheless, Mayo is convinced that "the incentives that drove the problems … are still in place today." Top bank executives are once again making as much as they did before the crisis, even though the government had to bail out a large share of banks. The biggest major banks did not shrink, as was intended, but instead have become even larger. New accounting rules were passed, but financial managers can still hide the value of their receivables and collateral behind nebulous terms like "transaction" or "customer order." Bank balance sheets, British central banker Andrew Haldane said caustically, are still "the blackest of boxes." Before the crash, investment banks gambled with derivatives known by acronyms like CDO and CDS. Today Wall Street institutions try to get the upper hand with high-frequency trading, with their Dark Pools and millisecond algorithms. Regulators fear that high-frequency trading, also known as flash trading, could create incalculable risks for the global financial system. When analyst Mayo thinks about the modern banking world, he imagines a character in the Roman Polanski film "Chinatown," California detective Jake Gittes. The man solves one corruption case after another, and yet the crime level in Los Angeles doesn't go down. "Why is that?" he finally asks another character, who merely replies: "Forget it, Jake. It's Chinatown." It's the same with the banking industry, says the analyst. Individual institutions aren't the problem, he explains. The problem is the system. "The banks are Chinatown," says Mayo, "and it is still the situation today." The little village of Wimmis lies in an area of Switzerland that still looks quintessentially Swiss, the Bernese Oberland, or Highlands, where Swiss flags flutter in front yards. The local tanning salon is called the "Sunne Stübli" (little sun room) and under "item five" of the latest edition of the town's "Placard Ordinance," posted outside the town administration building, organizations must secure their public notices "with thumbtacks" and "not with staples." Everything has its place in Wimmis, as it does in Markus Wenger's window factory. The business owner, with his thinning hair and crafty eyes, is the embodiment of the old saying, "time is money." He walks briskly through his production building, the size of a football field, passing energy-saving transom windows, energy-saving patio doors and energy-saving skylights, which can be installed between solar panels, also to save energy, a system Wenger developed. "We constantly have to think of new things," he says, "otherwise the Czechs will overtake us." Wenger could pass for a model businessman from the regional chamber of commerce were it not for his support for a political initiative that's about as un-Swiss as banning cheese production in the Emmental region. Wenger advocates raising the inheritance tax. Since then, a hint of class struggle pervades Swiss Alpine valleys. A series of popular initiatives have been launched, initiatives the financial newspapers have labeled "anti-business." To begin with, the Swiss voted on and approved a cap on so-called "rip-off salaries." Another referendum sought to impose a ceiling on executive compensation, but it failed. A proposal by Social Democrats, Greens and the socially conservative EVP, to support government pensions with a new tax on large inheritances, will be put to a referendum son. Income isn't the problem in Switzerland, where the gap between rich and poor is no wider than in Germany or France. The problem is assets. No other country has as many major shareholders, financiers and investors, and in no country is as much capital concentrated in so few hands. The assets of the 100 wealthiest Swiss citizens have increased almost fivefold in the last 25 years. In the Canton of Zürich, the 10 richest residents own as much as the poorest 500,000. When a Swiss business owner died recently, his two heirs inherited an estate worth as much as all single-family homes and owner-occupied flats in the Canton of Appenzell Innerrhoden. Wealth has become so concentrated in Switzerland, says the former head of the Zürich statistics office, that it "rivals the wealth of medieval princes." The government benefits hardly at all from this wealth. The Swiss tax authorities recently collected all of 864 million Swiss francs (€715 million) in inheritance tax, and this revenue source is unlikely to increase anytime soon. To attract wealthy individuals, the cantons have reduced their tax rates to such low levels that even estates worth billions can be left to the next generation without being subject to any taxation at all. In the past, the Swiss were fond of their quirky high society, whose lives of luxury in places like Lugano were as spectacular as their bankruptcies. But now, a large share of the super-rich comes from the financial industry, and even an upright window manufacturer like Markus Wenger is often unsure what to make of the demands coming from his high-end customers. A homeowner recently asked Wenger if he could gold-plate his window fittings. And when he was standing in an older couple's 500-square-meter (5,380-square-foot) apartment not long ago, he found himself wondering: How do they heat this? Wenger is no revolutionary. He likes the market economy and says: "Performance must be rewarded." His support for a higher inheritance tax is not as much the result of his sense of justice, but rather a cost calculation that he explains as soberly as the installation plan for his Windows. This is how Wenger's calculation works: Today he pays about €8,000 a year in social security contributions for a carpenter who makes 65,000 Swiss francs (€54,000). But the Swiss population is aging, so contributions to pension insurance threaten to increase drastically soon. Doesn't it make sense, he asks, to exact an additional, small contribution from those Swiss citizens who hardly pay any taxes at all today on their rapidly growing fortunes? For Wenger, the answer is obvious. But he also knows that most of his fellow business owners see things differently. They are worried about an "attack by the left" and prefer to support their supposed champion, Christoph Blocher, the billionaire spiritual head of the Swiss People's Party. Only recently, Blocher convinced the Swiss to limit immigration by workers from other European countries. Now Wenger expects Blocher to launch a new campaign under the motto: "Are you trying to drive our business owners out of the country?" There is more at stake than a few million francs for the national pension fund. The real question is whether wealthy countries like Switzerland should become playthings for their elites. Wenger sees the industrialized countries embarking on a dangerous path, the path of greed and self-indulgence, and he believes Blocher's party is the most visible expression of that. Blocher is pursuing a "policy for high finance," says Wenger. "He is fighting on behalf of money." The entrepreneur from the Bern Highlands has no illusions over his prospects in the upcoming conflict with the country's great scaremonger. The Swiss are likely to vote on the inheritance tax initiative next year. "In the end," Wenger predicts, "the vote will be 60 to 40 against us." He was the face of the Reagan revolution, a young man with large, horn-rimmed glasses and thick hair, wearing a suit that was too big for him as he sat next to the hero of conservative America. As former President Ronald Reagan's budget director, David Stockman was the architect of the biggest tax cut in US history and the propagandist of the "trickle-down" theory, the Republican tenet whereby profits earned by the rich eventually benefit the poorer clases. Thirty years later, Stockman is sitting on a Chesterfield sofa in his enormous mansion in Greenwich, Connecticut, an affluent suburb of New York, where the stars of the hedge fund industry conceal their tasteless mansions behind red brick walls and jeeps owned by private security companies are parked on every street corner. Stockman is wearing a green baseball cap and a black T-shirt. It's a sunny early fall morning, but the mood in the brightly lit rooms is strangely somber. The rooms are empty, there are boxes stacked in the corners and a servant is wrapping the silverware in the dining room. Stockman is moving to New York, into an apartment he has already rented in Manhattan. But it isn't entirely clear whether he is only moving to be closer to TV studios and newspaper editors, or if the move signifies a departure from his previous life. It was a life that took him through the executive suites of Washington politics and the US financial industry, a life that has placed Stockman in an almost unparalleled position to recount the aberrations of American capitalism in the last three decades. "We have a financialized, central-bank dominated casino," he says, "that is undermining the fundamentals of a healthy growing capitalist economy," he says. Ironically, Stockman was the one who wanted to reshape that society, back in the 1980s, when Reagan made him the organizer of his shift to so-called supply-side economics. Like the actor-turned-president from California, Stockman believed in free markets, low taxes and reducing the role of government. But Stockman also believed in healthy finances, which placed him at odds with the California contingent on Reagan's team who saw themselves as lobbyists for industry and the military. When Reagan's chief of staff, Donald Regan, declared the phrase "tax increase" to be taboo after the 1984 election, Stockman knew that he had lost. But it was more than a personal defeat. It was a triumph of irrationality, one that led Stockman to permanently disassociate himself from his party's fiscal policies. "The Republican concept of starving the beast is the worst thing in terms of fiscal rectitude that you can imagine," Stockman says today. "It's even worse than the Keynesian models of the Democrats." The debt policy of the Reagan years was the first mistake of America's conservative revolutionaries, but not the only one. There is another fallacy, one that Stockman also participated in when he went to work for the investment bank Salomon Brothers and later the private equity firm Blackstone after his ouster from the White House. It was the time when it had become politically fashionable to unfetter the financial industry; a time when then-Fed Chairman Alan Greenspan, Stockman's old acquaintance from the Reagan team, was inventing a new monetary policy: Whenever the economy and the markets showed signs of weakness, he reduced interest rates, and when a large financial institution ran into trouble, it was bailed out with the help of the central bank. Greenspan's policy of cheap money became a sweet poison for Wall Street, the chief ingredient of the dangerous debt cocktails brewed up by the wizards at London and New York investment banks, with Stockman front and center. The former politician became a virtuoso of the leveraged buyout, a complex financial deal in which in investor buys companies with borrowed money, restructures them or carves them up, and then sells them at a profit. The deals made Stockman rich, but they also turned him into a junkie. His projects became increasingly risky and the towers of credit he constructed became taller and taller. "I was an addict," he says. "I got caught up in the process." Disaster struck in 2007, when one of his highly leveraged companies went bankrupt. He was indicted on fraud charges, and the bankruptcy cost him millions and damaged his reputation. It became his "road to Damascus experience," as he calls it, when the financial crisis erupted a short time later. He concluded that the same mistakes that had destroyed his company also took the United States to the brink of an abyss: cheap credit, excessively high debt and a false sense of security that everything would ultimately work out for the best. Stockman again became the rebel he had been at the beginning of his career. He gave up his position in the financial industry, started a blog in which he settled scores with both policymakers in Washington and the financial oligarchy on Wall Street and he wrote an almost 800-page analysis of the "Great Deformation" of US capitalism. The conservative is furious over his country's transformation into a debt republic of the sort the Western world has never before seen in times of peace. A republic in which going to college is paid for with borrowed funds, as is the next military campaign. A country which hasn't actually dismantled its gigantic pile of debt since the crisis -- $60 trillion -- but has merely redistributed it. While the banks were allowed to pass on a large share of their bad loans to taxpayers, the government is in more debt than ever before. The mountain of debt appears smaller than it is because the Fed keeps interest rates low. At the same time, though, all this cheap money is driving the United States into a risky race against time, one in which no one knows what will happen first: the hoped-for economic boom or the next crash. Experts, like former Treasury Secretary Robert Rubin, believe the current rally in the markets is in fact the precursor to the next crash. The primary beneficiaries of the market rally seen in recent months are the 10 percent of top earners who own more than 90 percent of financial assets. But for average Americans, the policies instituted in response to the crisis have been poverty inducing. After the crash, millions of US citizens first lost their homes and then their jobs -- and now the social divide in the country is as big as it was in the 1920s. While wealth has grown at the top of the income scale, the median household, or the household that lies statistically at the exact middle of the scale, has become $50,000 poorer since 2007. In the past, part of the promise of the American dream was that anyone who worked hard enough could eventually improve his or her situation. Today the wealthy enjoy most of the fruits of US capitalism and the most salient feature of the system is the fear of fear. No one knows what might happen if the Fed raises interest rates next year as planned. Will pressure from rising costs cause the government deficit to explode? Will the stock market bubble burst and will financial institutions collapse? Will the economy crash? Only one thing is certain: In the seventh year of the financial crisis, the US economy is still addicted to debt and cheap money. Worst of all, the withdrawal phase hasn't even begun. "There is no possibility of a soft landing (with the) markets as completely distorted and disabled as they are today," Stockman says in parting. "There will be some great conflagration. It's just the question of when." Michael Klaus flips open his mobile phone, which he has been doing a lot of these days. He taps the screen with his finger to display the current yields on 10-year German government bonds. "Germany 10 Year: 0.80," the screen reads, using the abbreviated terminology of the Bloomberg market service. "You see," he says, "yields are down again. They were at 0.84 yesterday." It's Wednesday of last week. The Frankfurt banker is walking down Friedrichstrasse in Berlin on his way to a meeting with fellow members of the Confederation of German Employers' Associations. The latest labor agreement is on the agenda, but Klaus is still thinking about the number on the screen of his mobile phone, yet another reaction to the most recent plans of Mario Draghi, the president of the European Central Bank (ECB). Such rates are almost always a reaction to Draghi, at least they have been since the euro crisis got going. According to economics textbooks, security prices are determined by supply and demand. But in the reality of the monetary union, they usually follow the rates set by the top monetary watchdog in Frankfurt. In Klaus's assessment of the situation, "to put it in somewhat exaggerated terms, we live in a central-bank-administration economy." For the last quarter of a century, Klaus, a management expert, has been working for Metzler, a traditional, private bank based in Frankfurt. He is now a partner and exudes the self-confident nonchalance of a man who knows that his customers need to show up with at least €3 million to become his clients. His biggest asset is reliability. Unlike the large, powerful banks, his bank would be unable to count on government assistance in a crisis. It is not big enough to be too big to fail. Partly for that reason, Klaus is particularly bothered by the ECB's development in recent years. He sees it as a kind of hedge fund a kind of ministerial administration. Because Europe's major banks are ailing and national governments are at odds, the ECB has developed into the most powerful bureaucracy on the Continent. It controls interest rates and the money supply, drives prices on the exchanges and financial markets, supervises financial institutions and audits governments. According to Klaus, the European Central Bank has all but "replaced" the European bond market. It made sense at the time, because it protected the monetary union from breaking apart. But now emergency aid has turned into long-term assistance. The effects of ECB measures are subsiding, and financial experts aren't the only ones to notice that their programs have recently done more harm than good. That was the case with Draghi's latest package last month. To stimulate lending to small and mid-sized companies, the ECB announced its intention to begin large-scale buying of special debt instruments known as asset-backed securities, or ABS. The only problem is that far too few of these securities exist in Europe. This leads many experts to worry that lenders will simply fill the gap by transforming bad debt from their portfolios into ABSs and pass them on to the ECB. The investment effect would be next to nothing. Draghi's plan to provide long-term funds to banks if they can demonstrate that they passed it on in the form of loans to companies or households could also prove harmful. They must only offer proof in 2016, meaning they could first invest the money in government bonds, a surer bet these days than corporate bonds. Another recent Draghi measure is particularly dangerous: the "negative deposit interest rate." It means that banks no longer earn anything when they park their money with the ECB. On the contrary, they are required to pay for the privilege. This too is meant to encourage banks to lend. In reality, however, the measure makes the situation even more difficult for financial institutions like savings banks and cooperative banks, which are dependent on customer deposits. Because of the current low interest rates, these banks already earn almost nothing from the spread between savings and lending rates. If interest rates are pushed down even further, profits will continue to decline. "Ironically, this torpedoes the business model of savings banks and cooperative banks, which have thus far managed to survive the crisis in relatively good shape," says Klaus. Many experts are worried that with measures like these, the ECB is achieving precisely the opposite of what it wants to achieve. Instead of being strengthened, the credit sector is weakened. Instead of reducing risks, new ones are being created. Instead of liquidating ailing banks, they are kept alive artificially. The economy has had little experience thus far with the new crisis capitalism, with its miniature growth, miniature inflation and miniature interest rates. But economists learned one thing after large credit bubbles burst in recent years, in Japan and Scandinavia, for example: After a financial and banking crisis, the first order of business is to clean up the banks, and to do it quickly and radically. Institutions that are not viable need to be shut down while the others should be provided with capital. In Europe, however, this process has dragged on for years, under pressure from the financial lobby. The condition of the industry is now so dismal that experts are using metaphors from the world of horror films to describe it. "Zombie banks" are those that are being kept alive artificially with government bailouts and, like the zombies in Hollywood films, are wreaking havoc throughout Europe. They are too sick to lend money to the real economy but healthy enough to speculate with financial investments. Many banks today, says Bonn economist Martin Hellwig, can only "survive in the market by speculating." What distinguishes the current situation from the wild years before the financial crisis is that speculators were once driven by greed but have since turned into speculators motivated by need. Private banker Klaus has seen enough on his market app. He closes the phone with a worried look on his face, and then he utters a sentence in the typically convoluted idiom of the financial industry: "If Europe slips into a recession, it could lead to substantial turbulence in the financial markets." The man who introduced the concept of "inclusion" into the political debate is sitting in his office in Boston. There are mountains of papers on the round conference table: academic papers, pages of statistics from the International Monetary Fund, and the latest issue of the Anarcho-Syndicalist Review. Daron Acemoglu is currently considered one of the 10 most influential economists in the world, but the native of Istanbul doesn't think much of titles and formalities. He prefers the relaxed look of the web community: a plaid shirt and jeans, and a Starbucks cup in his hand. He became famous two years ago when he and colleague James Robinson published a deeply researched study on the rise of Western industrial societies. Their central thesis was that the key to their success was not climate or religion, but the development of social institutions that included as many citizens as possible: a market economy that encourages progress and entrepreneurship, and a parliamentary democracy that serves to balance interests. The only problem is that such institutions do not arise automatically. They have to be promoted and defended, especially against those social classes and interest groups that use power to seal themselves off from competitors, secure their own benefits and seek to influence lawmakers accordingly. Extremely well read, Acemoglu can cite dozens of such cases. One is 14th century Venice, where a small patrician caste monopolized maritime trade. Another is Egypt under former President Hosni Mubarak, whose officer friends divided up key economic posts among themselves but were complete failures as businessmen. These are what Acemoglu calls "extractive processes," which lead to economic and social decline. The question today is: Are Western industrial societies currently undergoing a similar process of extraction? Acemoglu leans back in his chair. He isn't one to make snap judgments, and he understands the contradictions of social trends, in the United States, for example. On the one hand, the US is more inclusive today than in the 1960s, because it has abolished racial segregation. On the other hand, says Acemoglu, he has noticed the growing influence of powerful interest groups: the pharmaceutical industry, insurance companies and, most of all, Wall Street. "The problem of money in politics," says Acemoglu, "is particularly acute in the case of the financial industry." US politicians spend up to 70 percent of their time raising money for their campaigns, and Wall Street is one of their most important sources. Experts have calculated that Bill and Hillary Clinton alone have garnered at least $300 million in donations from the financial industry since the early 1990s. In addition, money is no longer the only factor shaping the connections between Wall Street and Washington, as Acemoglu demonstrated in a recent study about former US Treasury Secretary Timothy Geithner. The stock prices of financial firms, with which he maintained close relationships, climbed significantly after his nomination. "The fact that some companies had the ear of the Secretary of the Treasury," Acemoglu concludes, "was, at least by the market view, very valuable." It has nothing to do with bribery, Acemoglu clarifies. Still, the process highlights the dangerous closeness between the financial industry and the political world, a phenomenon which can be seen elsewhere in the world as well. In Germany, for example, Chancellor Angela Merkel took steps to prevent a Greek insolvency at least partly out of consideration for German banks invested there. 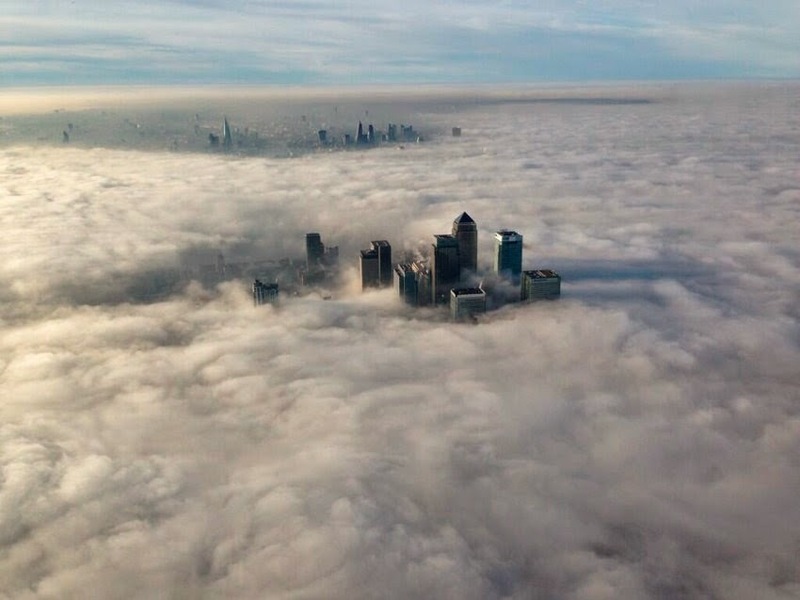 The London financial industry, to cite another example, was instrumental in blocking EU plans for the introduction of a financial transaction tax. In Switzerland, billionaire Blocher finances referendum campaigns via his political party. "The rich are extremely powerful," Acemoglu says, "and that is a concern." Limiting that influence is of the utmost importance, Acemoglu believes, so that today's upper-class, high-finance capitalism can once again revert to being a capitalism of the real economy and the societal center. The necessary economic reforms are not Acemoglu's primary focus, even if the relevant proposals have existed for a long time: a fiscal policy that doesn't just benefit the rich; a monetary policy that knows its limits; a reform of the financial and banking industry that separates the traditional savings and lending business from risky investment banking. That won't be enough, Acemoglu believes. What is needed, he argues, is a new political alliance that takes a stand against the power of the financial industry and its lobby. He sees the anti-trust movement from the beginning of the last century in the United States as a model. It was a broad coalition from the center of society and finally achieved its great victory after decades of struggle: the breakup of major corporations like Standard Oil. Will something comparable happen with the big international banks? Acemoglu doesn't know, but he is convinced of one thing: Elitist conferences, at which bankers and fiscal policy experts hold sophisticated conversations about "inclusion," will not bring about change. The organizers of the World Economic Forum once again sent him an invitation to Davos recently. But Acemoglu declined, as he has done several times in the past. "Solutions to the world's problems are not produced in a meeting between Bill Gates and George Soros," he says. "Renewal has to come from below." Expect to see a few pullbacks of 5% or more in an average year, writes a JPMorgan strategist. Markets are questioning the divergence being seen across central bank policy, just as concern about global economic growth is rising. None of this should come as a surprise – the policy path we’re on has been quite clearly scripted. The U.S. continues to lead the global recovery and there is rising concern that policy gradualism is threatening to pull Europe back into recession. Europe may be three years behind the U.S. in its recovery, but the pace of policy response and reform is moving at about one-third of the U.S. pace. Sentiment in a word is tired, and it is being reflected in the broad swings we are seeing across markets currently. Having started each of the past four years excited about the pace of recovery, investor expectations have repeatedly been disappointed. But something important is being missed: Global growth continues to improve. While there is legitimate frustration about the pace of Europe’s recovery, for global markets the direction of recovery is being confused with the pace. This is not an exuberant recovery. It’s going to remain slow moving and increasingly uneven, but we are not seeing a slide back into recession. All of this is happening at a point where no asset class is cheap. Equity and credit markets have rerated and are fully valued for where we are in the investment cycle. That isn’t a positive or a negative remark. It’s an observation about being midcycle in the current recovery. The easy money to a large extent has been made. We’ve seen about $400 billion dollars invested back into global equity markets since 2010; more than $330 billion of that this year and last. Investors aren’t overreaching for risk, they remain cautious and many have missed out on the run-up these past few years across markets. That frustration is weighing on sentiment. We have been in an extraordinarily low volatility market environment for the past three years. Investors have forgotten what a normal level of volatility feels like. We would expect to see 3-4 pull backs of 5% or more on the Standard & Poor’s 500 in an average year. We haven’t seen that happen since 2011. With valuations no longer cheap, higher volatility is going to remain with us as price discovery across fixed income and equity markets becomes more engaged. Fundamentally, that is a healthy sign as investors move from debating whether or not to invest, to focusing on what to invest in – and at what price. We are seeing that happen across markets currently. Bond markets are going to continue to frustrate investors and delight fixed income traders. With less momentum driving global growth, there is going to be less pressure for the Federal Reserve or the Bank of England to be aggressive in the pace of raising policy rates next year. That’s good news for all markets as they adjust to Fed and BoE tightening. That observation does not make long maturity government bonds a good investment; however, it should provide additional support for markets. The Fed and Bank of Japan have tried to talk down the pace of recent U.S. dollar appreciation. Too much, too fast of anything is never good for you. I would make the same observation about the collapse in European government interest rates, starting with Germany. Markets expect the dollar to remain strong and strengthen further from here -- but not because investors are running away from the perceived failure of central bank policy elsewhere. The European Central Bank should take notice. A weaker euro helps but won’t resolve a still feeble recovery. We have seen back-to-back strong markets these past few years and some general consolidation should be expected. It has been the one thing missing. What matters most is that we have a global economy still in modest-paced recovery. It isn’t the number of days that define where we are in the recovery cycle; rather, it is where we are with regard to employment, wage growth, investment, consumption and most importantly inflation expectations. We do not believe that we have hit a tipping point in the current cycle. Negative headlines aren’t helping sentiment and should not be dismissed either. The world appears to be a scarier place for anyone following geopolitical headlines than it was even a year ago. That too is weighing on current market sentiment. Managing return expectations is going to be the greatest challenge as we look ahead. Continuing to focus on corporate earnings will help investors manage those return expectations. Markets aren’t cheap, but that’s an observation about the amount of risk in a portfolio, not an observation about whether or not to be invested. We are very much invested in markets, but not overreaching for risk. Regarding our fundamental as well as investment outlook, pragmatism prevails. 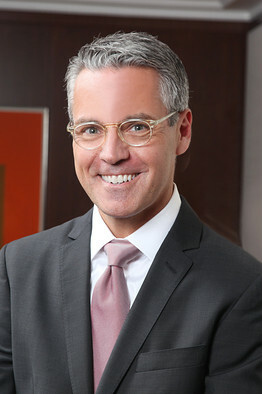 Madigan is chief investment officer of J.P. Morgan Private Bank, a unit of JPMorgan Chase. As we anticipated in a recent column, the International Monetary Fund and the World Bank have just released pretty grim economic forecasts for Latin America in 2015. But the truth is, only three big countries will do badly — and the rest of the region will do pretty well. Both the IMF and the World Bank, which held their annual meetings in Washington, D.C., last week, estimated that Latin America and the Caribbean will grow by a meager 2.2 percent next year, one of the region’s worst performances in the past 15 years. The headline of the IMF’s regional outlook for the region referred to “challenging times,” and one of its first subchapters forecast “dimmed prospects” for the region. But if you take the three worst performing countries — Venezuela, Argentina and Brazil — out of the equation, you get a totally different picture. Their economies are so big that they distort the entire picture, dragging down the remaining 28 countries included in the studies when economists do a simple average of the region’s growth. After the figures were released, I asked the World Bank to calculate what the region’s growth would be without taking into account the weight of Venezuela, Argentina and Brazil. The resulting figure depicted a much brighter outlook: It showed that Latin America without the three under-performing countries would grow by 4 percent for next year. That’s more than how much the United States, Europe and several regions of the developing world are expected to grow next year. According to the World Bank’s projections, Brazil — Latin America’s biggest economy — will barely grow by 0.5 percent next year, while Venezuela’s economy will shrink by 2.9 percent, and Argentina’s will contract by 1.5 percent. On the other hand, Mexico, Colombia, Peru, Ecuador, Bolivia, the Dominican Republic and most other countries in the region are projected to grow by around 4 percent, or more. Mexico is projected to grow by 3.8 percent next year; Panama will grow by 6.4 percent; Peru, by 5.5 percent; and Colombia, by 4.7 percent, the World Bank projections show. Many independent economists say it’s time to stop lumping all Latin American economies together. ▪ Financially responsible countries: They include Mexico, Colombia, Peru, Chile, Panama, Paraguay and most countries in the region, which try not to spend more than what they earn, and seek to save for a rainy day. Most of them are projected to show healthy growth rates next year and beyond. ▪ Financially irresponsible countries with luck: They include Ecuador and Bolivia, which have followed Venezuela’s steps nationalizing companies and taking other anti-business measures, but started doing these things much more recently. They are relatively lucky, because the world is awash with cash looking for short-term high yields, and they can still get some speculative investments to keep their economies going. “Ecuador and Bolivia are accidents waiting to happen,” says Bernal. He added that Ecuador, for instance, has used the proceeds of expropriations and defaults on public debts to generate a mirage of prosperity. ▪ Financially irresponsible countries that have run out of luck: Prime examples are Venezuela and Argentina. They grew a lot thanks to record high world commodity prices in the past decade, and embarked on populist spending sprees. But now, with falling commodity prices, the fiesta is over, and they are bankrupt. My opinion: The IMF and World Bank’s depressing forecasts for Latin America shouldn’t be a reason to be pessimistic about the whole region. They are largely a reflection of Brazil, Argentina and Venezuela’s dismal economic prospects. What should be far more worrying would be if the entire region failed to learn the lessons from the economic collapses of Venezuela and Argentina: that populist policies generate pan para hoy, hambre para mañana (bread for today, hunger for tomorrow), as has become evident by now. The real story about the just released regional economic projections is that there are several Latin Americas, and only one of them is doing badly. IN EARLY October the IMF looked at what might happen to the world economy if conflict in Iraq caused an oil-price shock. Fighters from Islamic State (IS) were pushing into the country’s north and the fund worried about a sharp price rise, of 20% in a year. Global GDP would fall by 0.5-1.5%, it concluded. Equity prices in rich countries would decline by 3-7%, and inflation would be at least half a point higher. IS is still advancing. Russia, the world’s third-biggest producer, is embroiled in Ukraine. Iraq, Syria, Nigeria and Libya, oil producers all, are in turmoil. But the price of Brent crude fell over 25% from $115 a barrel in mid-June to under $85 in mid-October, before recovering a little (see chart). Such a shift has global consequences. Who are the winners and losers? The first winner is the world economy itself. A 10% change in the oil price is associated with around a 0.2% change in global GDP, says Tom Helbling of the IMF. A price fall normally boosts GDP by shifting resources from producers to consumers, who are more likely to spend their gains than wealthy sheikhdoms. If increased supply is the driving force, the effect is likely to be bigger—as in America, where shale gas drove prices down relative to Europe and, says the IMF, boosted manufactured exports by 6% compared with the rest of the world. But if it reflects weak demand, consumers may save the windfall. Today’s falling prices are caused by shifts in both supply and demand. The world’s slowing economy, and stalled recoveries in Europe and Japan, are reining back the demand for oil. But there has been a big supply shock, too. Thanks largely to America, oil production since early 2013 has been running at 1m-2m barrels per day (b/d) higher than the year before. Other influences are acting as a brake on the world economy. But a price cut of 25% for oil, if maintained, should mean that global GDP will be roughly 0.5% higher than it would be otherwise. Some countries stand to gain a lot more than that average, and others, to lose out. The world produces just over 90m b/d of oil. At $115 a barrel, that is worth roughly $3.8 trillion a year; at $85, just $2.8 trillion. Any country or group that consumes more than it produces gains from the $1 trillion transfer—importers, most of all. China is the world’s second-largest net importer of oil. 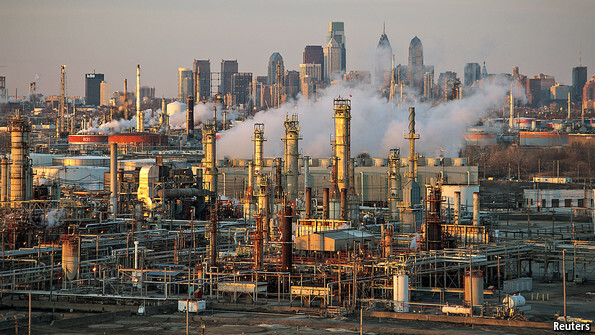 Based on 2013 figures, every $1 drop in the oil price saves it an annual $2.1 billion. The recent fall, if sustained, lowers its import bill by $60 billion, or 3%. Most of its exports are manufactured goods whose prices have not fallen. Unless weak demand changes that, its foreign currency will go further, and living standards should rise. Cheaper oil will also help the government clean up China’s filthy air by phasing out dirty vehicle fuels, such as diesel. Lighter fuels are dearer and, under current plans, drivers could pay up to 70% of the extra; lower prices will soften that blow. More generally, says Lin Boqiang of Xiamen University, lower prices should support the government’s efforts to reduce subsidies (it has already freed some gas prices, and electricity prices are expected to follow next year). The impact on America will be mixed because the country is simultaneously the world’s largest consumer, importer and producer of oil. On balance cheaper oil will help, but not as much as it used to. Analysts at Goldman Sachs reckon that cheaper oil and lower interest rates should add about 0.1 percentage points to growth in 2015. But that will be more than offset by a stronger dollar, slower global growth and weaker stockmarkets. America is a net importer, so lower prices mean Americans get to keep more of their money and spend it at home. But the stimulative impact is less than it used to be, since imports are becoming less important, and oil is shrinking as a share of the economy. The Energy Information Administration, an independent government agency, expects net oil imports to drop to 20% of total consumption next year, the lowest share since 1968. In the early 1980s, when oil accounted for over 4% of GDP, a 1% price drop would boost output by 0.04%, says Stephen Brown of the University of Nevada, Las Vegas. That had fallen to 0.018% by 2008, and he reckons it is now about 0.01%. Cheaper oil could make more of a difference to monetary policy. Inflation expectations have become more stable since the 1980s, which means that the Fed feels less need to act when oil prices shift. But with inflation below its 2% target, it will fret that falling oil prices could be pushing expectations down, making it harder to keep inflation on target. It could decide to keep interest rates at zero for longer, or even extend its bond-buying programme (“quantitative easing”). Fears of deflation apply with greater force in Europe. Energy imports into the European Union cost $500 billion in 2013, of which 75% was oil. So if oil prices stay at $85, the overall import bill could fall to under $400 billion a year. But the benefits would be muted twice over. First, inflation in the euro zone is even lower than in America. Mario Draghi, the head of the European Central Bank, claims that 80% of its decline between 2011 and September 2014 was caused by lower oil and food prices. Oil at $85 could lead to deflation, provoking consumers to rein in spending further. Second, European energy policy is only partly to do with price and efficiency. Europeans are also trying to reduce dependence on Russia and to cut carbon emissions by turning away from fossil fuels. Cheaper oil makes these aims slightly harder to achieve. But one group of countries gains unambiguously: those most dependent on agriculture. Agriculture is more energy-intensive than manufacturing. Energy is the main input into fertilisers, and in many countries farmers use huge amounts of electricity to pump water from aquifers far below, or depleted rivers far away. A dollar of farm output takes four or five times as much energy to produce as a dollar of manufactured goods, says John Baffes of the World Bank. Farmers benefit from cheaper oil. And since most of the world’s farmers are poor, cheaper oil is, on balance, good for poor countries. Take India, home to about a third of the world’s population living on under $1.25 a day. Cheaper oil is a threefold boon. First, as in China, imports become cheaper relative to exports. Oil accounts for about a third of India’s imports, but its exports are diverse (everything from food to computing services), so they are not seeing across-the-board price declines. Second, cheaper energy moderates inflation, which has already fallen from over 10% in early 2013 to 6.5%, bringing it within the central bank’s informal target range. This should lead to lower interest rates, boosting investment. The International Energy Agency, an oil consumers’ club, reckons that the global cost of subsidising energy consumption (mostly in developing countries) is $550 billion a year. The fall in the oil price should reduce that, all else being equal, to about $400 billion. That means many countries face a choice: seize the moment to dismantle subsidies, or keep on handing out goodies that now cost less? Either way, they will benefit—by ending an economic distortion (though with some risk of a consumer backlash), or by reducing its fiscal cost for a while. The choice is particularly stark for oil importers in the Middle East (see chart). Energy subsidies cost Egypt 6.5% of GDP in 2014, Jordan 4.5%, and Morocco and Tunisia 3-4%. A 20% fall in the oil price would improve the fiscal balances of Egypt and Jordan by almost 1% of GDP, says the IMF. But, fears Mr Baffes, the efficiency gains may not be enough to persuade regimes, especially shaky ones, to cut subsidies that mostly benefit the politically influential middle clases. Many other countries are also wrestling with energy subsidies. Indonesia spends about a fifth of its budget on them. Gulf oil exporters are even more profligate: Bahrain spends 12.5% of GDP and Kuwait, 9%. Brazil wants a high oil price to attract investment to its ultra-deep offshore (pré-sal) oil reserves. But cheap oil is a boon to its farmers, and in the short term to Petrobras, its state-controlled oil firm, which has been forced to import at world prices and sell at a government-capped rate in order to keep inflation artificially low. For the first time in years, it is no longer making a loss on the imports it sells. It might seem that the country which is the world’s largest exporter must lose out. With oil at $115 a barrel, Saudi Arabia earns $360 billion in net exports a year; at $85, $270 billion. Its budget has almost certainly gone into the red. Prince Alwaleed bin Talal, an influential businessman, called lower prices a “catastrophe” and expressed astonishment that the government was not trying to push them back up. But Saudi Arabia’s long-term interest may in fact be served by a period of cheaper oil. It can afford one, unlike most other exporters. Though public spending has risen in recent years, its foreign reserves have risen more. Net foreign assets were 2.8 trillion riyals ($737 billion) in August—over three years’ current spending. It could finance decades of deficits by borrowing from itself even if oil were cheaper than it is now. Over the past year production by non-OPEC countries, such as Russia and America, has risen from 55m b/d to 57m b/d. The Saudis might conclude that the main beneficiaries of dear oil have been non-OPEC members. Some of the new output is high-cost, unlike the Saudis’. A period of cheaper oil could drive some high-cost operators to the wall, discourage investment in others and let the Saudis regain market share. In the mid-1980s Saudi Arabia cut its output by almost three-quarters in an attempt to sustain prices. It worked and other countries cashed in—but the Saudis themselves suffered a big loss of revenues and markets. They see little reason to make such a sacrifice again. Saudi Arabia can survive low prices because, when oil was $100 a barrel, it saved more of the windfall than it spent. The biggest losers are countries that didn’t. Notable among these are three vitriolic critics of America: Venezuela, Iran and Russia. “However low the oil price falls,” Nicolás Maduro, Venezuela’s president, declared on October 16th, “we will always guarantee...the social rights of our people.” The reality is quite different. Hugo Chávez, his predecessor, dismantled a fund intended to squirrel away windfall oil profits, spent the money and ran up tens of billions of dollars in debt. That debt is now coming due. Earlier this month a hefty service payment took Venezuela’s foreign reserves below $20 billion for the first time in a decade. Every dollar off the price of a barrel cuts roughly $450m-500m off export earnings. By Deutsche Bank’s calculation, the government needs oil at $120 a barrel to finance its spending plans—higher than before the recent tumble. So, unlike other oil exporters’ budgets, Venezuela’s was already in trouble. Last year’s fiscal deficit was a reckless 17% of GDP. In response, the government printed bolívares, pushing inflation (even on official measures) over 60%. Industrial production is grinding to a halt and Standard & Poor’s, a ratings agency, downgraded Venezuela’s debt to CCC+ last month. Analysts have long thought it would move heaven and earth to avoid default—not least because it has overseas assets that creditors could seize and depends heavily on financial markets. But the “d” word is increasingly often heard. The impact of Venezuela’s oil-related travails may be felt beyond its borders. The country runs a programme called PetroCaribe, which provides countries in the Caribbean with cheap financing to buy Venezuelan oil. For Guyana, Haiti, Jamaica and Nicaragua annual deferred payments under PetroCaribe are worth around 4% of GDP. But it costs Venezuela’s government $2.3 billion a year. So if Venezuela decides to cut back on its largesse, the shock waves will be felt throughout the Caribbean. Iran is even more vulnerable than Venezuela. It needs oil at $136 a barrel to finance its spending plans, most of them inherited from the profligate and inefficient government of Mahmoud Ahmadinejad. Last year it spent $100 billion on consumer subsidies, about 25% of GDP. Sanctions mean it cannot borrow its way out of trouble. Hassan Rouhani, who took office last year, has re-established a degree of macroeconomic stability. The central bank said the economy grew in the second quarter of 2014 for the first time in two years. But he was elected on the promise of improving living standards. It is not yet clear whether lower oil prices will force further reforms, and increase pressure for a deal with America over Iran’s nuclear programme, or whether falling revenues will boost support for conservatives who are already making trouble for him. For Russia the impact will be less dramatic, at least at first. Its draft budget for 2015 assumes oil at $100 a barrel; below that, it will be harder for Vladimir Putin, the president, to keep his spending promises. Something similar happened when the oil price fell in the mid-1980s, leaving the indebted Soviet Union cash-strapped. 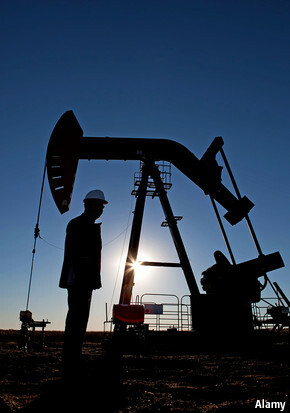 But Russia now has reserves of $454 billion to cushion against oil-price fluctuations. More important, the rouble has fallen. Next year’s budget assumes a dollar is worth 37 roubles, so it balances with oil at 3,700 roubles. A barrel currently costs 3,600 roubles (a much smaller fall than the dollar price), because the currency has plunged 20% this year. With oil at $80-85 a barrel Russia would probably run a budget deficit of only about 1% of GDP next year. All the same, the country will suffer a slowdown. For years, real incomes rose, thanks to wage increases in the state sector. The increased spending went on imports made cheaper by a strong currency. So the slide in the rouble is cutting living standards by making imports dearer. Western sanctions have closed capital markets to Russian firms, even private ones. Business activity is waning. A senior finance-ministry official says the share of non-oil-and-gas revenues in the budget is shrinking, making Russia more dependent on oil. Some analysts think growth in 2015 will be just 0.5-2%, compared with about 4% a year in 2010-12. Inflation is 8%. Russia, it seems, is headed towards stagflation. For most governments—Venezuela’s is a possible exception—cheaper oil is likely to have a modest impact at first. Even Mr Putin may be able to ride out stagflation for a while. But over time, the consequences are likely to grow. The years of $100-a-barrel oil also saw the rise of a “Beijing consensus” towards more economic interventionism. Perhaps a period of $85 oil—if that were to happen—might usher in another shift in attitudes, assumptions and policies. Might the policies of the eurozone result in a robust recovery? My answer is: no. Since the eurozone generated 17 per cent of world output in 2013 (at market prices), that answer has global significance. It is Germany that set the economic strategy of the eurozone. It consists of three elements: structural reform; fiscal discipline; and monetary accommodation. So far, this set of policies has failed to generate adequate demand: in the second quarter of 2014, real demand in the eurozone was 5 per cent smaller than it was in the first quarter of 2008. Both France and Italy are being encouraged to accelerate “structural reforms” as a way to reignite growth in their own economies and so, given their importance, also in the eurozone. These two countries generate 38 per cent of eurozone gross domestic product, against 28 per cent for Germany alone. In both economies, the recommended programmes involve liberalising the labour market. They are both being encouraged to follow Germany’s “Hartz reforms”, introduced between 2003 and 2005, to which the country’s relatively good recent labour market performance is often attributed. Yet the one thing those reforms did not do is create dynamic aggregate demand. Between the second quarter of 2004 and the second quarter of 2014, Germany’s real domestic demand grew 11.2 per cent, a compound annual rate of 1 per cent. It could have been worse. But this is hardly the performance of a “locomotive” (see chart below). Examination of Germany’s sectoral financial balances – the differences between income and spending of the government, private sector and foreigners – strengthens this point. The response of the German private sector to the reforms of the early 2000s was to increase financial surpluses massively: that is, to spend far less than their incomes. Since the fiscal deficit also shrank, the capital outflow soared. This is striking and significant. In brief, the response of the private sector to the labour market reforms and fiscal tightening was to become increasingly frugal and so accumulate large quantities of (often poor-quality) foreign assets. In terms of raising private domestic demand, reforms achieved little. On the contrary, Germany became heavily dependent on foreign demand. Similarly, fiscal tightening did not unleash stronger private spending. Expecting similar labour-market reforms to promote demand in France and Italy is likely to prove highly over-optimistic. This does not mean reforms achieved nothing. Germany has low unemployment despite quite weak growth. The UK also has relatively low unemployment despite still weaker post-crisis economic growth. In both cases, the labour reforms encouraged the sharing of a large negative shock across the population via stagnant or even falling real earnings. A symptom of this form of an adjustment is weak productivity. In German industry, productivity has not risen since 2007. Productivity performance has also been poor in the UK. But German unemployment was 4.9 per cent in July and the UK’s only 6 per cent against 10.4 per cent in France. Is The Stock Market Rally For Real? The S&P 500 has rallied 5.7% in 4 days, an impressive performance. We believe debt market dynamics and central bank expectations have fueled the move. Next week's FOMC statement is likely to produce significant volatility. US stocks had a fourth straight impressive day today, with major averages rising nearly 2% or more. After plunging last week, the S&P 500 (NYSEARCA:SPY) is less than 4% off of the all-time high of 2019. The chart below shows the current technical posture. 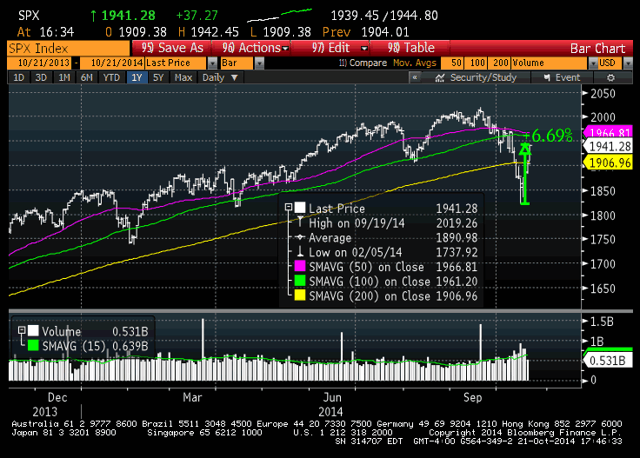 As can be seen, the S&P 500 burst through the 200 day moving average today with impressive force. The next area of technical resistance should be located at the 1960-1966 area, corresponding to the 50 and 100 day moving averages. We believe it is important to examine the underpinnings of the powerful four day rally in order to understand what might lie in store. We believe that a great deal of the recent rally can be explained using changes in expectation regarding the future path of the Fed Funds interest rate. 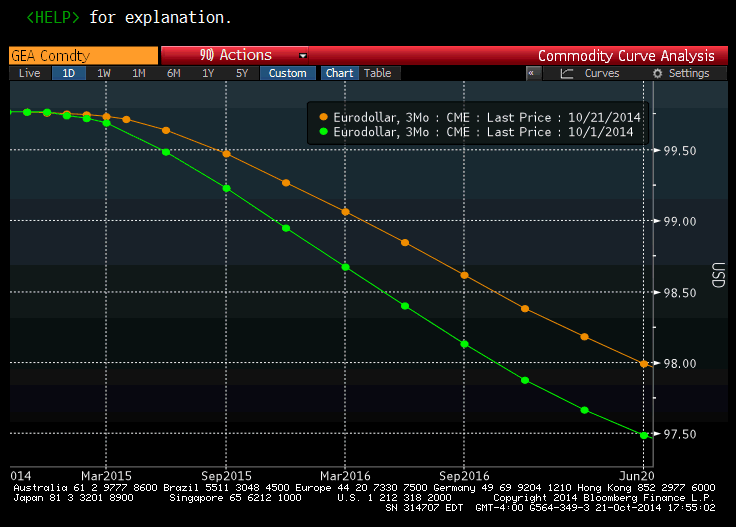 The following chart shows the Eurodollar curve on October 1st in green and the same curve today in brown. As a quick primer, Eurodollar futures have nothing to do with the euro or dollar as currencies. Eurodollar futures are ways for hedgers and speculators to bet on the future Fed Funds rate. Subtracting the Eurodollar futures contract value from 100 gives one the contract's current expectation of future Federal Reserve-set interest rates. As an example, if the December 2016 Eurodollar futures are trading at 98.50, it means that the traders of that contract expect that the Fed Funds rate will be at 1.50% in December 2016. At the beginning of this month, December 2016 Eurodollar futures were trading at 97.80, implying a 2.2% Fed Funds rate at the end of 2016. Due to recent market volatility, traders have now bid up this contract to 97.38, a full 58 basis points higher. Similar moves occurred in all maturities of the Eurodollar curve, meaning investors have unanimously pushed out their expectations for how fast Janet Yellen and the Fed will raise interest rates. Perhaps on its own, this change in expectations would be unremarkable, and actually understandable given the recent volatility expansion. However, due to the Fed's mandate to increase communication started a few years back, we know that we have a massive disparity developing in investors' expectations versus the Federal Reserve's. The following chart is from the Federal Reserve's September publishing of their Staff Economic Projections. These are a direct depiction of FOMC members' views regarding the Fed Funds rate that is published every 3 months. 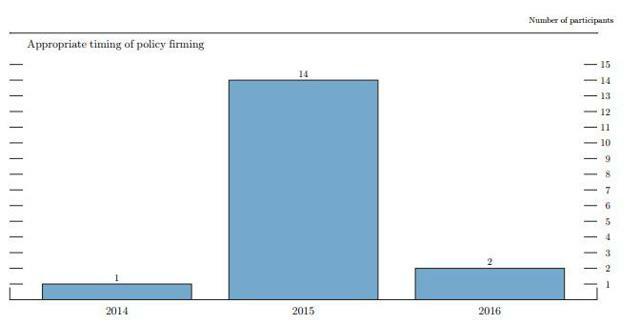 The following chart shows how many members expect in which year the Fed will begin raising interest rates. As can be seen, the vast majority (14/17) members expected that the Fed Funds rate would be raised in 2015. These opinions were culled during the FOMC meeting ended on September 17th. The following chart shows a more detailed view of FOMC participants' interest rate views. 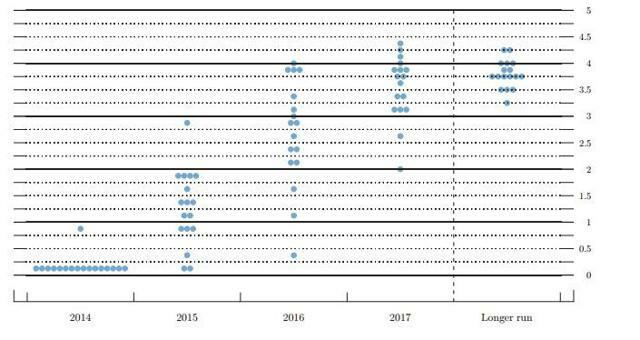 The dots correspond to members' views regarding rates. 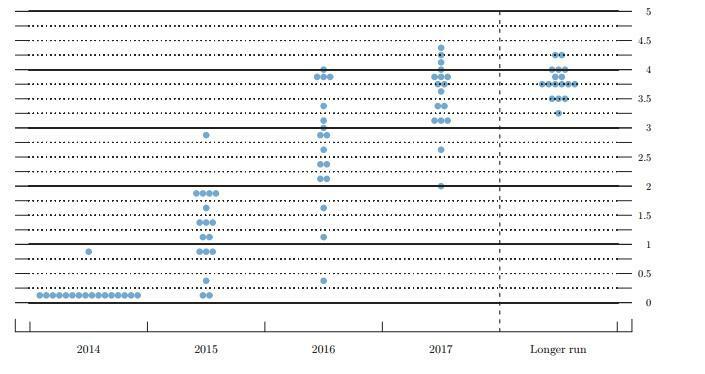 As can be seen, the majority of the FOMC expect rates to be 0.75% or higher at the end of 2015, and 2% or significantly higher by the end of 2016. Since this publishing of the Staff Economic Projections, worldwide equity markets have been roiled by Ebola, global growth concerns, and a myriad of other given reasons for increased volatility. Investors have been so spooked by the gyrations that they now believe the Federal Reserve's posture has fundamentally changed towards a much more accommodative stance. At this point, the market's expectation of the Fed Funds rate at the end of 2015 is 0.75%, whereas the Fed's median end of 2015 expectation is 1.25%. The December Eurodollar expectations are even more out of line, with the market's expectation being 1.62% Fed Funds rate at the end of 2016 versus the Staff Economic Projection median of 2.75%. Essentially, investors are betting a (slightly less than) 10% correction in the S&P 500 is enough to get the Fed to completely abandon their projections and push interest increases out in a major way. Given recently dovish statements such as Bullard's implication that the Fed could perhaps delay the end of quantitative easing and the well-chronicled dovish tendencies of Janet Yellen, it is easy to see why the market expects this. However, the reflexive nature of the market's change in expectations is bound to perplex the Fed in next week's meeting. At the time that Bullard suggested last week that the Fed could have a major departure from stated policy and continue QE rather than end it next week, the S&P 500 was trading at 6 month lows and threatening to plunge even more. Given the violent pullback of -9.84% in just under a month, Fed officials were understandably concerned about market contagion, especially considering highly negative developments in European and the Hong Kong market. However, the powerful rally of the last few days puts the Fed in an extremely awkward situation. At this point, the S&P 500 is less than 4% off the all-time high, hardly a concerning plunge when ignoring the volatility that occurred in the meantime. Going into next week's meeting, the Fed must be relieved that the market has corrected itself and found footing, but on the other hand they too can see the market's drastic change in interest rate expectations. The Fed's conundrum is, do we make accommodative interest rate language changes to the FOMC statement and risk fueling even more speculative behavior, or do we risk rocking the boat and sending financial markets reeling again by making no change and reiterating our data-driven stance, which would be viewed as hawkish? The decision faced by the FOMC will only get more convoluted if and when financial markets rally over the coming week. We believe the stock market rally has been fueled by investors' expectations for lower future interest rates and a highly accommodative Federal Reserve stance. However, it is highly probable that both of these conditions are not mutually sustainable. Our view that equity markets are rallying simply due to decreased interest rate expectations is highly worrisome. Given the stage of the cycle the Fed has painted us in, investors' expectations could snap back considerably if the Fed does not continue to disseminate accommodative chatter. We believe that a rallying stock market will only embolden the Fed to begin policy normalization in the path they envisioned and published just over a month ago. This would cause interest rate expectations to reset dramatically, triggering a severe correction in bonds and Eurodollar futures, which could also trigger a renewed correction in equities if investors are disappointed. On the other hand, we believe the stabilization of fixed-income products at current prices could only be justified by further volatility and financial market turmoil, which would be accompanied by lower equity prices. What this means for investors is that a simultaneous move upwards in the bond and stock market from current levels is unlikely. Either the stock market, bond market, or both will fall from current levels to justify the other. Given the severe retraction in the VIX and implied volatility across the board, investors could use put options to effectuate a position given this thesis. Traders could purchase the November 22nd 117 put on the TLT ETF (NYSEARCA:TLT) to bet on rising interest rates for $0.60 while simultaneously purchasing the November 22nd 190 put on SPY for $2.02. Given that volatility of bonds will be much more subdued than equities, traders could purchase this combination of options in a 2.5:1 ratio, meaning 2.5 put options on TLT for each 1 on SPY. For longer-term minded investors considering whether the current rally in the S&P 500 should be bought or sold, we would advise a position on the sidelines. While the rally of the past few days has been impressive, we note that such wild volatility is rarely the sign of a healthy market. While we fully acknowledge a move back to the all-time highs is possible, it is no better than an even money trade at this point. We would advise longer-term investors to be defensive here and reevaluate in light of the Fed's decision and subsequent market reaction next week.